It is truly frightening to be in a room full of people who are laughing and not get the joke. I don’t just mean not get the punch line, but not get the words, the meaning or anything else. To feel as if one is from another planet and has landed here with a cursory knowledge of the English language and a two-day session on the lives and mating patterns of human beings under his belt, only to have to listen to two voracious baseball fans discussing the importance of the infield fly rule. Maybe I missed something; maybe something was never there. I walked into the High Art Museum at about 9:30 at night and was greeted by one person in a fake moustache, then another, then another. I was overwhelmed and confused. Apparently this was the theme of the evening. Moustaches, moustaches everywhere. I had heard that at some point in the evening some men who had real moustaches were going to shave them off. It was one of those hipster rollicking good time things that I’m sure would have really impressed me back when I had rollicking hipster intentions. 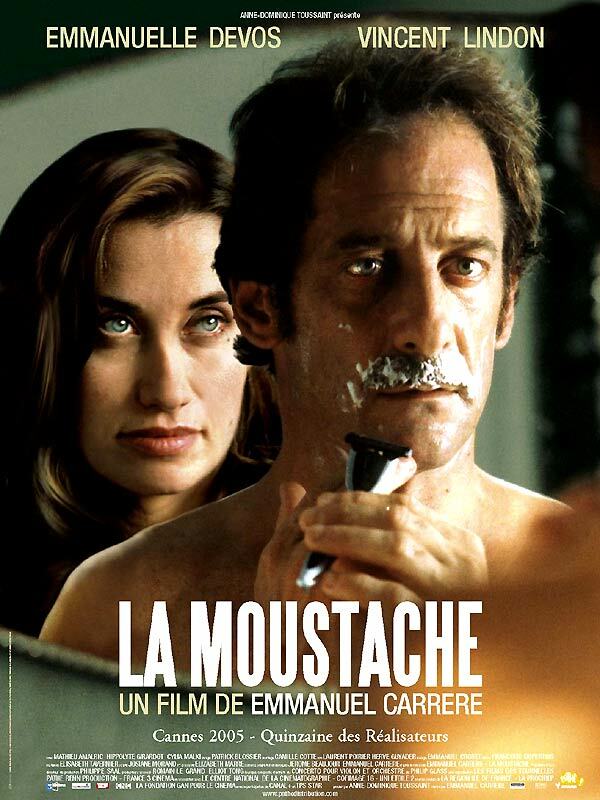 The main purpose of this whole thing was to show Emmanuel Carrere‘s surrealist film “La Moustache“. Because of this, I decided to leave my house on a Friday night for the first time since Carter was in office. I love the film. It is a deceptively simple story of madness and personal alienation. A man shaves his moustache and no one believes he ever had one. That’s really all of it. In spite of its insane story line, it manages to come across as a remarkably realistic picture what it is like to experience genuine confusion. For some reason, I had it in my head that seeing the film in a theater would be even better. What I didn’t really get until the lights dimmed was that seeing 2001: A Space Odyssey in a theatre is a unique experience because you have an opportunity to see special effects that were meant for a big screen. Seeing a yuppie French couple arguing over the husband’s bizarre personal grooming fantasies is not anymore enjoyable around a bunch of popcorn chomping film fans. As a matter of fact, it’s pretty damned depressing. The woman who introduced the film was some former film critic from the Atlanta Journal Constitution who really didn’t know very much about the film or the writer or the director or French cinema or how she got to the building in the first place. She kept saying over and over that this film was “funny…really, really funny.” This set a monumentally bad tone for the evening. The crowd immediately settled in, ready for a French yuckfest on par with the work of Johnny Knoxville. I have to tell you, I’ve laughed at a lot of thoroughly inappropriate things in my day, so I guess I had this evening coming to me. I nearly got tossed out of the Phipps Plaza Theater some years back for nearly laughing myself into straightjacket for the last 15 minutes of the faux horror classic “The Devil’s Advocate”. I spent a good portion of my younger years telling horrendously insensitive jokes about everyone from Mother Theresa to Ted Bundy. This night was my punishment for many a sin against good taste. Hopefully, this will count as my confession and I will be absolved of further mental floggings. I sat there for a good hour and a half with blank expression on my face. The audience exploded with laughter over and over again at the most inopportune times. Marc, the main character played by Vincent Lindon, wanders through the film slowly losing touch with everyone he knows and loves. He begins to doubt the very fabric of reality, becomes a stranger in his own body and disappears into a blinding fog of regret, scorn and loneliness. Hysterical stuff! Marc sifts through the trash, trying to find any proof that his experience is real, that he is not living an unexplainable fantasy and that his mind isn’t decaying. Stop it, my side is hurting! Truth be told, this is a horrifically sad movie. So many wander through life trying to catch up to the world, trying to understand an endless series of in jokes and references that fly by them, hoping to understand what the world means while being handed self-help books and truisms about “being yourself” and “trying your hardest”. Our personal realities often do not mesh with the world. Our truths are often only true in our minds. One minute’s certainty is the next minute’s mirage. There are nearly 7 billion of us blindly groping for a light switch in the dark only to be handed an octopus. This is the message of The Moustache. To take this film as a lighthearted romp is to miss a wonderfully genuine explanation of what it is like to be a human. Or maybe I just don’t get it. This entry was posted on November 6, 2010, 7:50 PM and is filed under Existential Rambings, Mr. Spillett's Academy Of Film Study For The Mentally Tormented. You can follow any responses to this entry through RSS 2.0. You can leave a response, or trackback from your own site. Was the movie critic perhaps Eleanor Ringel? I know her ha ha.